Anatomy: As its common name implies, the blue morpho butterfly’s wings are bright blue, edged with black. The blue morpho is among the largest butterflies in the world, with wings spanning from five to eight inches. Their vivid, iridescent blue coloring is a result of the microscopic scales on the backs of their wings, which reflect light. The underside of the morpho’s wings, on the other hand, is a dull brown color with many eyespots, providing camouflage against predators such as birds and insects when its wings are closed. When the blue morpho flies, the contrasting bright blue and dull brown colors flash, making it look like the morpho is appearing and disappearing. The males’ wings are broader than those of the females and appear to be brighter in color. Blue morphos, like other butterflies, also have two clubbed antennas, two fore wings and two hind wings, six legs and three body segments -- the head, thorax and abdomen. Habitat: Blue morphos live in the tropical forests of Latin America from Mexico to Colombia. Adults spend most of their time on the forest floor and in the lower shrubs and trees of the understory with their wings folded. 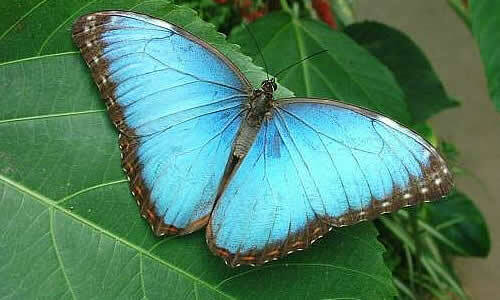 However, when looking for mates, the blue morpho will fly through all layers of the forest. Humans most commonly see morphos in clearings and along streams where their bright blue wings are most visible. Pilots flying over rainforests have even encountered large groups of blue morphos above the treetops, warming themselves in the sun. The blue morpho’s entire lifespan lasts only 115 days, which means most of their time is spent eating and reproducing. Diet: The blue morpho’s diet changes throughout each stage of its lifecycle. As a caterpillar, it chews leaves of many varieties, but prefers to dine on plants in the pea family. When it becomes a butterfly it can no longer chew, but drinks its food instead. Adults use a long, protruding mouthpart called a proboscis as a drinking straw to sip the juice of rotting fruit, the fluids of decomposing animals, tree sap, fungi and wet mud. Blue morphos taste fruit with sensors on their legs, and they "taste-smell" the air with their antennae, which serve as a combined tongue and nose. Threats: Blue morphos are severely threatened by deforestation of tropical forests and habitat fragmentation. Humans provide a direct threat to this spectacular creature because their beauty attracts artists and collectors from all over the globe who wish to capture and display them. Aside from humans, birds like the jacamar and flycatcher are the adult butterfly’s natural predators. The Blue Morpho butterfly, from the Lepidoptera order and the Nymphalidae family, live in the jungles of South and Central America. They very easy to spot even amongst the jungle canopy thanks to their very bright and shiny light blue wings. At the end of those wings are small brown dots. The brown shades continue to the underside of their wings which contains shades of brown, red, black and even some gray. While the males are very blue the females are less or not blue at all. Some interesting facts about butterflies, like the Blue Morpho in particular, are that they fly quickly through the thick jungle amongst the canopy. They enjoy bright sunlight and are their most active when they are in the bright light of the sun. With a length of nearly six inches, the Blue Morpho butterfly is one of the largest butterflies in the rainforest. If you’re planning a trip any time soon to Costa Rica, Brazil or Venezuela you might want to see about taking a trip into the jungle on a professional tour to see this rare and interesting butterfly. The Morpho butterfly is becoming endangered in its natural rainforest habitat. While conservation in North American butterfly houses is ongoing you might want to make a trip soon to see the butterfly in its natural environment. A Morpho Butterfly(Morpho menelaus), is one of over 80 described species of butterflies that reside in the rainforests. Morpho butterflies are neotropical butterflies found mostly in Central America as well as Mexico and South America including Brazil, Costa Rica and Venezuela. Morpho Butterflies dwell in the forest canopy layer and rarely come near the understorey and forest floor layers. Many Morpho butterflies are colored in metallic, shimmering shades of blue and green on the upper wing surface. The underside of the wings resembles foliage, with mottled brown, greys, blacks and reds. The female Morpho butterfly is less vivid than the male. The males bright colouring is designed to intimidate any rivals that might fly into his territory. The males wings reflect the bright, iridescent color over an extremely wide angle, to maximize its visibility in the rainforest. These colors are not a result of pigmentation but rather are an example of iridescence (an optical phenomenon characterized as the property of surfaces in which hue changes according to the angle from which the surface is viewed). The colors produced vary with viewing angle, however they are actually surprisingly uniform, perhaps due to the tetrahedral (diamond-like) structural arrangement of the scales. This structure may be called a 'photonic crystal'. The ventral side is decorated with 'ocelli' or eyespots. Not all Morpho butterflies have iridescent coloration, however, they all have ocelli. The eyes of Morpho butterflies are thought to be highly sensitive to UV light and therefore the males are able to see each other from great distances. There also exists a number of white Morpho species. An unusual species that is white in coloration, but which exhibits a stunning purple iridescence when viewed at certain angles. The metallic blue Morpho species (M. rhetenor) stands out as the most iridescence of all. Morpho butterflies are diurnally active (active during the day) and have the capability of 'crypis', meaning when they sleep at night, they fold their wings so that only the dark underside is seen, making them less visible to predators. It also has a 'flashing' defence mechanism, meaning, due to the slow beating pace of their wings, the iridescent blue is flashed and then disappears as the wings are raised only to return in another place in a short while. This causes predators to loose track of the Morpho butterfly when it is flying as they only glimpse blue flashes as the brown underside makes them invisible in the thick foliage of the jungle.